It begins with a goodbye. Rudolf Augstein is lying in Hamburg’s Israelitisches Krankenhaus with severe pneumonia on October 31, 2002. He dies a few days later on November 7, just after his 79th birthday. On the way home in the taxi, she begins to cry. “Has something terrible happened?,” asks the driver. “No, something normal.” “Your boyfriend?” She thinks for a moment. “In a few, brief moments, I suppose we were friends” (p. 11). 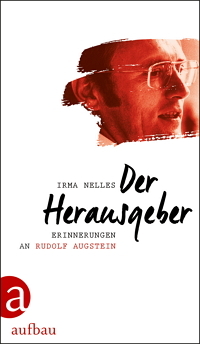 Born in 1946, Irma Nelles joined the Spiegel’s Bonn office in Summer 1973. She began as a secretary, before reducing her hours to train as a primary school teacher between 1976 and 1983. After graduation, Nelles moved to Hamburg, where she edited the magazines letters page. In 1993, she finally moved to the twelfth floor of the Spiegel building to manage the publisher’s office, which she did until his death. At the encouragement of friends, she has now written down her memories of the time for Aufbau Verlag. The author talks a great deal about herself in this book. She grew up in a rectory on the North Frisian island of Nordstrand. Her father brought the Spiegel home from visits to Hamburg twice a month. “I found the texts in the Spiegel complicated and difficult to understand. Also, they were almost always about men and rarely about dancers or actors” (p. 13). Her father was a big fan of the magazine and its publisher, saying “He finds out everything and does not put up with any nonsense.” Daughter Irma noticed “this Augstein (…) because he seemed to be a kind of Kalle Blomquist, master detective, who sometimes takes the big guys to task” (p. 14). Nelles married at the age of 22 and moved to the banks of the Rhine in Bonn with her husband and two children. Five years later, she spotted a job advertisement in the Bonner Generalanzeiger, applied and joined the Spiegel’s Bonn office as a secretary. In late Summer 1973, the publisher Rudolf Augstein announced that he would be visiting the office. “I couldn’t wait. Rudolf Augstein in person! You could tell immediately when he was there. On those days, the editors seemed to be more clean shaven and have neater hair than usual, and wore neat suits and even ties” (p. 24f.). Nelles sensed how the normally relaxed atmosphere in the offices changed. “It was almost as if God himself was at the door. Something like fear spread throughout the office” (p. 25). Nelles did not meet the publisher very often in the first few years, and fills these gaps in the book with a lot of irrelevant biographical elements. Having never worked as a journalist, Nelles is not practiced in assessing and filtering out the important information. 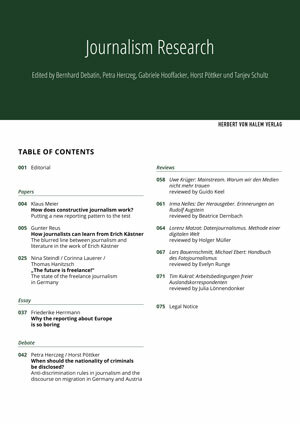 Political turmoil caused by events like the Günter Guillaume affair and the resignation of Willy Brandt in 1974 are mentioned, but do not play a significant role. Instead, she provides a great deal of detail on how the publisher regularly summons her to join him on holidays in Switzerland and France, where she gets to know her boss on a more personal level. However, these stories are rarely amusing and are often repeated over the 300 pages. Nelles clearly is not a natural author, and is unable to weave her everyday observations into an exciting story. The book is more boring than enlightening. The author does succeed in reinforcing the image of the man outlined in other reports (such as the biography Augstein by Dieter Schröder, 2004) in a more private, almost intimate, level of depth. Yet this very direct, almost diary-like record is still a long way from the “genre picture of German media history from the 1970s” promised in the publisher’s PR text. It is a personal portrait of a strange man who was undoubtedly important in German media history – no more and no less. The closer Irma Nelles’ relationship with Augstein becomes over the decades, the more others appear to turn away. The editors seem annoyed when he announces a visit, and he is not particularly welcome at headquarters in Hamburg, either. His few real friends are worried. Television and radio producer Henri Regnier and his wife Antonia spend a lot of time with Augstein and watch as he becomes more and more reclusive, appears almost “manically depressed” and begins to drink excessively. “A rich and famous man like that: Why does he have no-one and why does he not know what to do?” asks Nelles (p. 49). Antonia Regnier describes Augstein’s relationships with women as “Don Juanism” (ibid. ), and the couple attempts to persuade Nelles to take more care of Augstein. “He needs a woman to cook him soup” (ibid.). But his secretary never permits sexual or intimate approaches. Although she does not say in as many words, it is clear that she does not want a relationship with this man who appears so powerful, rich and famous on the outside, but is also so sensitive, self-pitying, depressive, alcohol-addicted, often surly, uncommunicative, aging – in short, contradictory man. She repeatedly lives close by or even under the same roof, but his approaches come to nothing. This is no wonder given his rather unchivalrous strategy. He once listened to a speech by the certifiable Greek shipping magnate Aristotle Onassis, who apparently had a prenuptial agreement amounting to millions of dollars with widow Jacqueline Kennedy, “who would give him nothing, absolutely nothing, in return.” Afterwards, Augstein says to Nelles, “Well, how about this: Twice a week.” Faced with her stunned silence, Augstein continues defiantly, “Twice (…). It can’t be that difficult” (p. 139f.). His closest employee thinks about her job and her partner living far away in Bonn and gently rejects Augstein’s advances. “Can’t we just wait and see how we get along? Maybe something will develop over time” (p. 141). But nothing like that does develop. Irma Nelles never succumbs to Augstein’s advances, despite remaining by his side. He began to write fewer and fewer opinion pieces and title stories, and was rarely seen in his office. At 78, Augstein was physically frail and living in the past. He was now “placid and conciliatory” (p. 313), even towards former rivals. In this “almost childish gentleness, close to death, it seemed as though Rudolf Augstein now wanted to show how vulnerable he really was. The tough, protective exterior that had always made him seem so pugnacious had vanished” (ibid.). The review first appeared in rkm:journal. Dr. Beatrice Dernbach is a Professor of Practical Journalism in the Technical Journalism/Technical PR program at Nuremberg Tech. Her focuses include specialist journalism; sustainability and ecology in journalism; narration and trust in journalism; and scientific communication. Irma Nelles (2016): Der Herausgeber. Erinnerungen an Rudolf Augstein. Berlin: Aufbau. 314 pages. EUR 22.95. Uwe Krüger: Mainstream. Why we no longer trust the media.